Hello beautiful people! I hope you’re having an amazing week so far. Today I’m here to talk about a product that is slowly and surely becoming my favorite deep conditioner. It’s an oldie, but it’s SUCH a goodie. 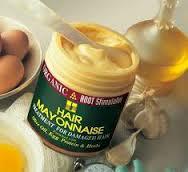 That product is ORS Hair Mayonnaise. So, purely for clarification purchases, let me tell you that this Hair Mayonnaise is THE BOMB DOT COM and if you don’t have it, you need to get your life together. I’ve drafted up some pros of this products for you guys, and honestly, there is nothing negative that I can say about this product. First of all, this product is a two in one so you really get a bang for your buck here. It’s a protein tratment AND a deep conditioner. You can also use it as a co-wash if you really want to. It has egg protein in it (which makes it a protein treatment), but it also has olive oil, keratin, and glycerin to give you a really good deep conditioner. It’s not a crazy heavy protein treatment, meaning that it doesn’t make your hair hard. That way, if ou’re protein sensitive, you could still use this with no problem. This product is also an application in itself. No more concocting your own DIY’s at home. It’s all there for you, so you can literally slap it on and go about your business. I use gloves, just in an effort not to waste the product or get my hands all messy. When washing this out of the hair, tangles slip right out. This product offers tons of slip. Hair is also left really soft, moisturized, and manageable. The softness comes from the deep conditioner portion of the product. Because this isn’t a heavy protein treatment, you can use it weekly. If this one isn’t available to me, I’ll use the Olive Oil cholesterol, which is also good. For themost part, though, I use this week after week, without fail. This thing is inexpensive and very cost eeffective! If you want to save your COINT, go out and get you some. I picked up a 16 ounce jar for about $3 at my local Family Dollar. On dry hair, I’ll spray my hair with water (to make it more manageable and so that I can be able to spread the product). I use about three palm sizes of he product with every application. In the first application, I’ll place it all over one of four sections that my hair is split into. In the second application, I’ll part my hair with my fingers and shingle the product through. In the third application, I’ll go over the section again, just for an even coverage. I really hope this helps, guys! Try it and let me know what you think.